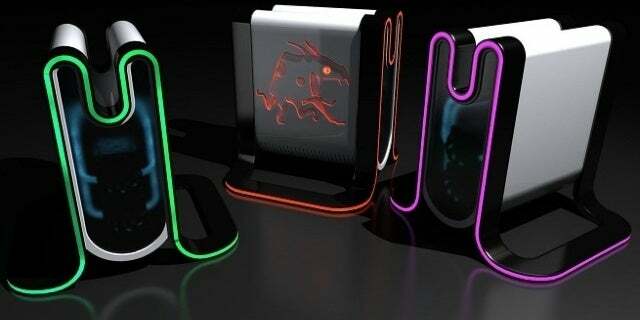 The first images of the Mad Box console have been revealed to show a colorful design with the Slightly Mad Studios logo. Slightly Mad Studios 'CEO and co-founder Ian Bell shared a surprise announcement days ago by saying the studio known for its games including the Project Cars series was working on a new console. Dubbed the Mad Box, information on the technical aspects and plans for the console were shared with the device said to support 4K displays and play virtual reality games at 60FPS. After those details were revealed, Bell returned to Twitter later with the first images of the new console that's still being worked on. Shaped like a "M" with the bottom sides flaring out to keep the console upright, it appears to come in multiple colors or can at least be configured to display different colors on the front, and sides. It also appears to have a see-through casing, but Bell said the console's console has been blurred due to ongoing talks about the console's components. When the console was first revealed, there was also the question of what games it would support. Bell initially said it would support old and new games from any developer thanks to an engine where developers can build their games, and another follow-up tweet elaborated on the engine and how it'll work. All independent developers on Earth will be handed a cross-platform, almost one click export engine to allow them to deploy their games on PC, Xbox, Playstation and Mad Box. Porting time will be minimal for those who have their own engine. The engine will be totally free. The Mad Box may well become a competitor in the console market against PlayStation and Xbox if it can pull off everything developers have already come forward with interest in creating games for it, but according to Bell, it will be a while before the product is released with the studio CEO give an estimate of three and a half years before it'll be available to consumers.